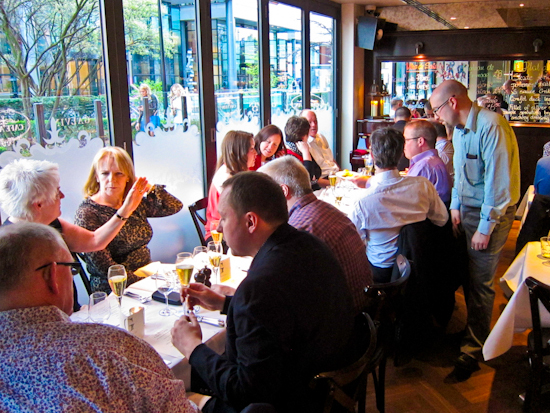 The culmination of the Galvin Brothers first British beer week at Galvin Café a Vin, in Spitalfields, is a five-course dinner matching beers and ciders with chef Jack Boast's dishes. Tasting menus, where wines are paired with gourmet dishes, are all the rage in restaurants throughout the world, but this is the first time I've been to a dinner with matched beers and ciders. Yes, of course I've drank copious amounts of ale with food in the past, but a different beer with each course is something new. What's more we're being introduced to each tipple by Mitch Adams, the imaginative landlord of the Thatchers Arms who's made his selection from small British producers. 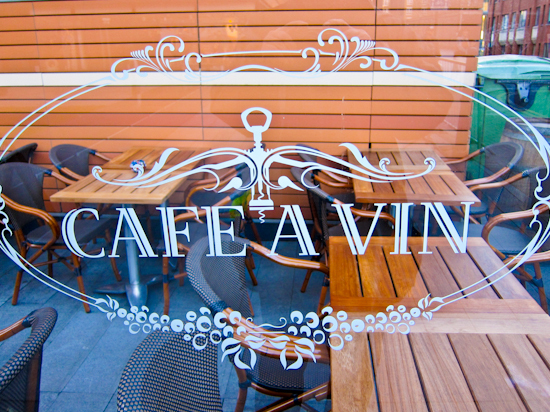 I arrive at the Galvin Café a Vin and a glass of what I take to be champagne is immediately thrust in my hand. Of course it's Aspall Cuvée Chevalier cider, with enough bubbles to fool me, and pleasantly refreshing after my cycle ride. There's a tiny piece of pizza, topped with smoked eel and cheese, to go with it and I realise that chef Jack Boast knows what he's doing. Now it's time for the first beer and Mitch Adams gets up to introduce Scarlet Fever from the Wild Beer Company, a hoppy red ale which will go with the beef tartare which arrives in front of us. Now I know that in Prague, this mix of beer and raw meat is a popular favourite and so it proves here. The crisp citrus flavour of the US hops is an excellent counter to the creaminess of the beef and the English malts add a background of caramel. 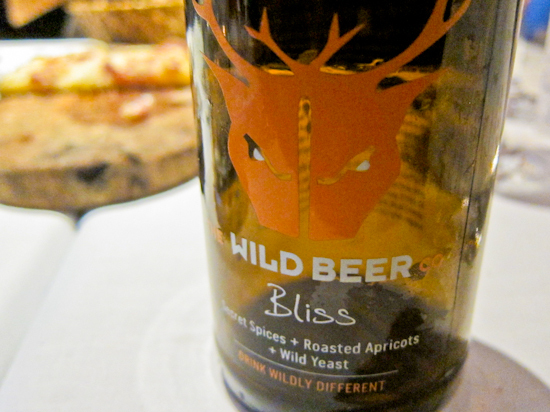 Mitch stands up again to talk about Bliss, from the same company, a Belgian style beer with wild yeast, added roasted apricots and a mix of cardoman and kaffir lime leaves. On the nose, you can really pick out the spices and it really does smell like ginger beer, although the taste is more apricot. 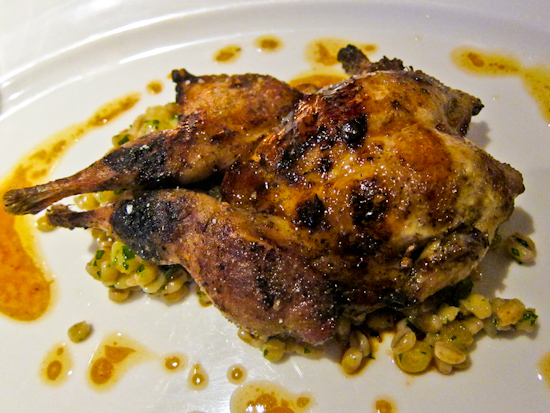 The spiced marinated grilled quail is delicious on its own, but the accompanying toasted barley and raison salad is a better match. 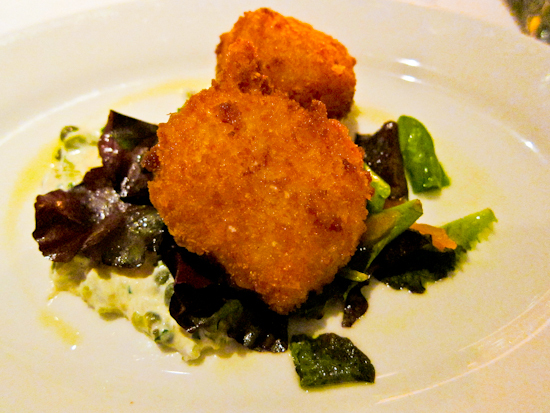 Next up is a beignet of scallop and smoked salmon served with Gribiche sauce. 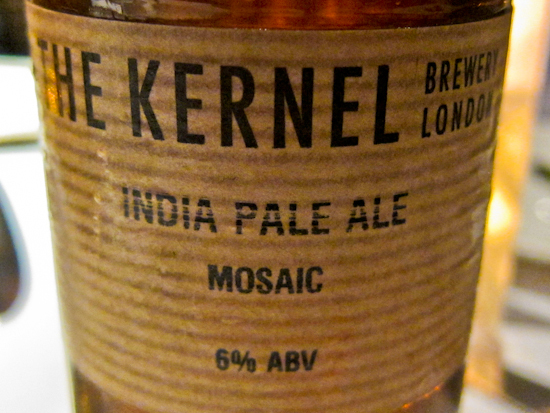 The beer is a Mosaic Pale Ale from the Kernel Brewery, slightly cloudy, with an aroma of red grapefruit. This is so fruity that I think the scallops are in danger of being overwhelmed but the small morsels of smoked salmon inside the fritter are an effective counter. Indeed, the remaining smoked eel proves to be an even better match. Now we come to what I think is the marriage made in heaven. 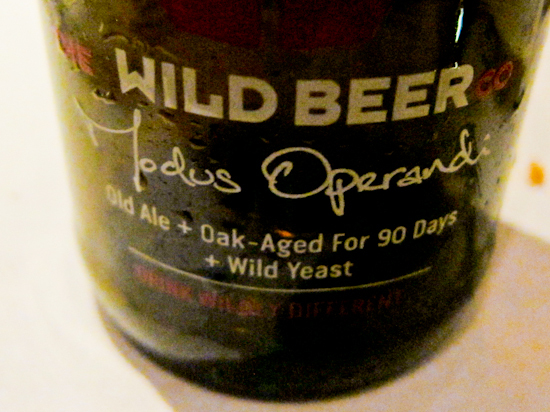 The Wild Beer Company's Modus Operandi has been aged in oak barrels with wild yeast for over 90 days. It's a dark beer with a smooth, rich, full body and fruit flavours of berries, sweet cherries with tannins from the wood. 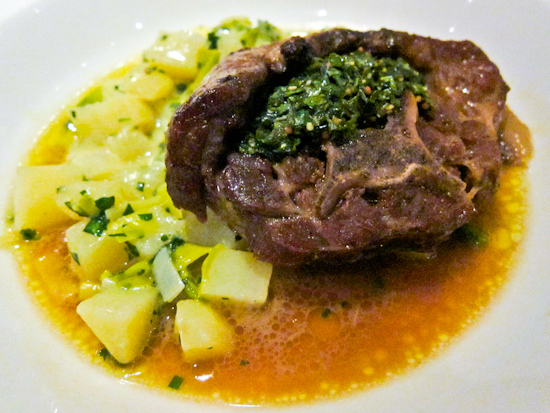 The slow cooked neck of spring lamb with diced potatoes and leeks is its ideal partner, better than any wine. Indeed it's not so surprising as a pint of mild served with meat and potatoes is what my old grandad would have for his lunch. The final course is Jack Boast's famous tarte tatin and now we're back in cider territory. 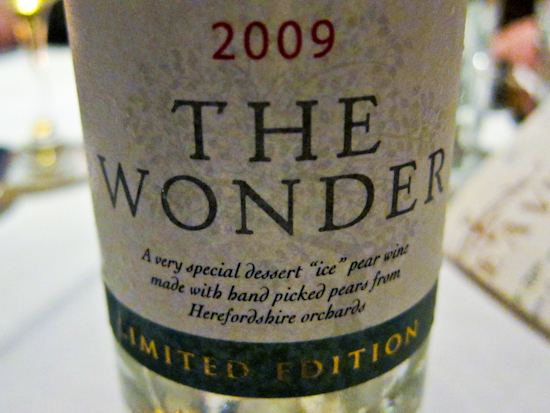 This time it's from Once Upon a Tree and is a dessert pear wine called The Wonder, 2009. Using techniques borrowed from ice wine, with an alcohol content of 12%, it's a mix of conference and comice varieties and made nowhere else in the world. 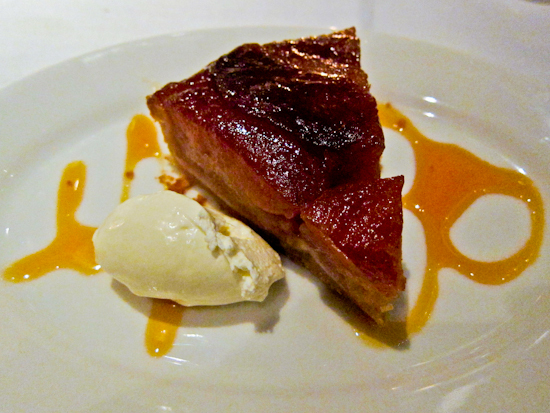 There are hints of apricot, quince and melon, each fruit perfectly complementing the sweetness of the apple in the tatin. 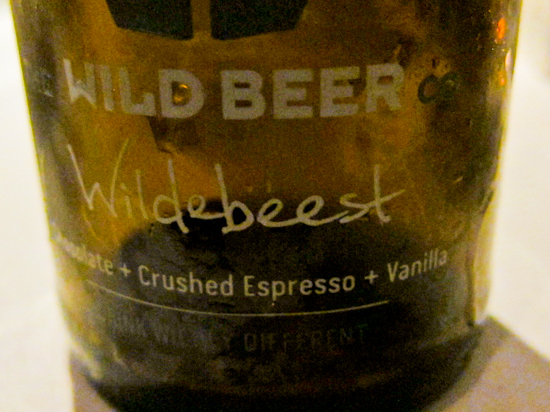 Mitch has a final surprise and produces Wildebeest, a Russian imperial stout, with a twist, from the Wild Beer Company. Valrhona chocolate, vanilla pods, coffee beans, have all been added to create what they describe as an Imperial Espresso Chocolate Vanilla Stout. The aroma is Kahlua or Tia Maria and, sipping it with a chocolate truffle, seems like logical conclusion to a very informative evening. 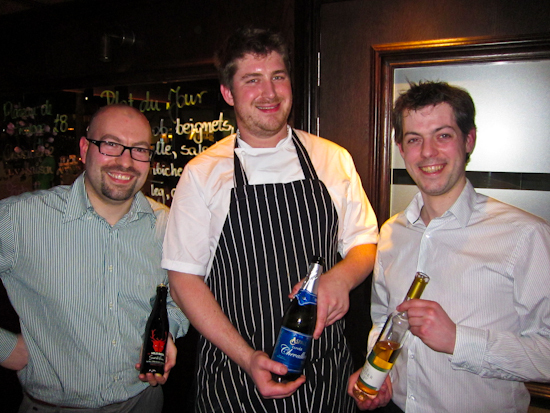 Congratulations to sommelier Andrea, Jack and Mitch. I have to confess I was slightly sceptical that beer could deliver the same imaginative pairings that are usually the role of fine wines. 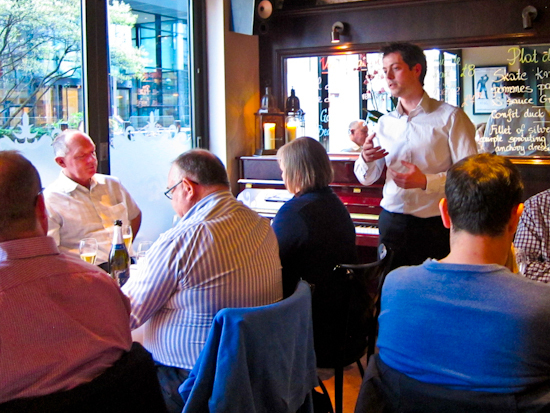 After all copious consumption of the stuff is something you do in the pub, rather than in a gourmet restaurant, and serving it in wine glasses, rather than pints, is the height of pretension. 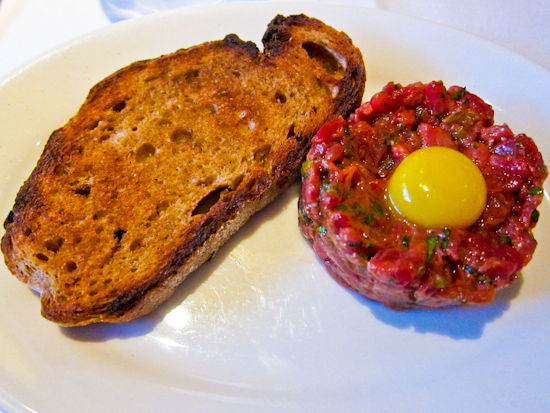 Fortunately I was completely wrong and I look forward to the next tasting, particularly when the food is this good and the beers are so distinctive. Drink Britain has more information about British beers and ciders.